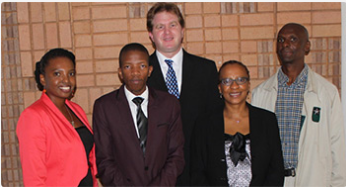 The Unisa Graduate School of Business Leadership (SBL) launched its first ever academic scholarship in 2012. The Judge Bernard Makgabo Ngoepe Academic Scholarship, named in honour of the Unisa Chancellor, was established to enable brilliant but needy students to pursue or complete their studies at the SBL. The scholarship affords the SBL the opportunity to contribute and empower emerging leaders to hone their skills and be able to answer the call of our current socio-economic challenges by providing needy South African students with the means to attain a Master of Business Administration (MBA), Master of Business Leadership (MBL) or Doctor of Business Leadership (DBL) at the Unisa SBL. The scholarship pays all tuition fees for one academic year and is awarded to students based on their academic performance and other requirements. In the 2013 academic year, eleven students registered for MBL (II and III) as well as MBA (II and III) were awarded the Judge Bernard Makgabo Ngoepe Academic Scholarship. The SBL prides itself as the only business school in South Africa that graduates the largest number of students in the MBA and MBL programmes annually and thus contributing enormously to alleviate the skills shortage in this country.